Primitive reflexes are reflex actions exhibited by every normal infant. These actions originate in the Brain Stem, and each serves a unique purpose for a child's mental and physical development. As a child progresses through sequential stages of development, these reflexes should become inhibited, and therefore do not present themselves in teenagers and adults. However, in some cases, primitive reflexes never integrate, or they can become reactivated due to stress, trauma, and other factors. Each reflex, when it is active in older children and adults, presents specific symptoms. Below are some examples of primitive reflexes and the role they play in the lives of infants, children, and adults. The STNR develops around 6 months after birth, and should be integrated between 9 and 12 months of age. This reflex allows children to get up off of the floor and begin crawling by separating the upper and lower halves of their body. The reflex pattern consists of two major movements that occur when a child is on their hands and knees. In this position, when a child lowers their head their arms will bend and their legs will straighten. Conversely, when they raise their head their arms will straighten and their legs will bend. 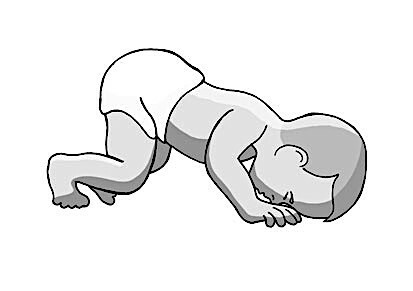 This short-lived reflex allows babies to get themselves into the proper crawling position. 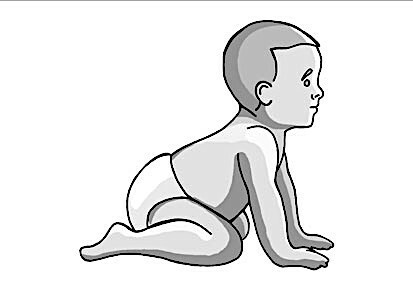 If the reflex is retained, the child will not crawl normally, and instead will "bear-crawl", scoot on their bottom, or skip straight to walking. The STNR is crucial for developing vision skills, a sense of balance, and eye-hand coordination. Click below to explore more symptoms of a retained STNR. The TLR develops in utero, 12 weeks after conception, and should be integrated by age 3. Just like the STNR, there are two positions associated with this reflex. When the infant bends their head forward, the arms and legs will bend and tuck inward. When they bend their head backwards, their arms and legs will straighten and splay outward. This reflex helps babies develop their sense of balance and spatial awareness through vestibular stimulation. Every head movement during this period affects muscle tone and proprioception, and if the TLR is not properly integrated then the child will struggle with balance, posture, and coordination throughout their life. The Moro reflex is a reaction that occurs when a sensory stimuli is processed as a threat. It develops in utero, 12 weeks after conception, and should be integrated 4 months after delivery. If the Fear Paralysis reflex is active, then the Moro reflex cannot integrate. 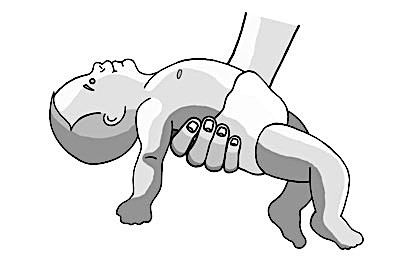 When the reflex is triggered, the infant will take a deep breath in and stretch their arms and legs away from their body. Then their fingers will clench, their arms and legs will bend in and they will start to cry. This is sometimes known as the "clinging reflex", because it developed as a survival technique. The infant is clinging to its mother for protection and crying to get attention. Hugging and rocking an infant will integrate the Moro reflex. However, it is often reactivated in teenagers and adults who experience everyday stress or unusual trauma. If this reflex is active, a person will be in a constant state of internal stress, and will exhibit many undesired symptoms. There are dozens of primitive reflexes that have been identified by the medical community, and these are just a handful of them. BRMT techniques have been developed to integrate and identify many more active reflexes, and these explanations serve only as a brief introduction to the science of child development and brain maturation. For more information on the reflexes covered in BRMT courses or the symptoms associated with active reflexes, contact Kate Wagner at retrainthebrain.att.net.